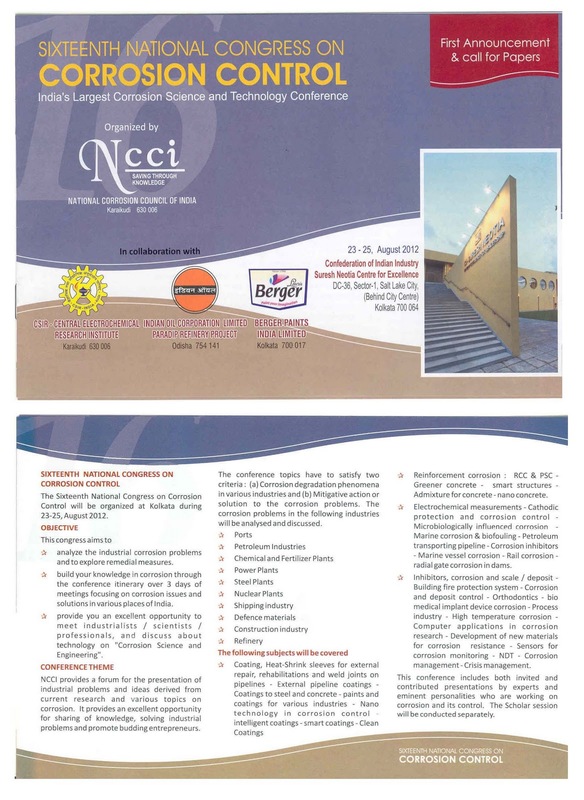 Conference organised by National Corrosion Council of India (NCCI), Karaikudi in collaboration with CECRI, IOCL-Paradip Refinery and Berger Paints India Ltd.
India - Infrastructure - Rs 2 crore Commonwealth Games Village flats good for only 20 years? 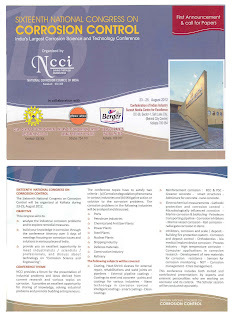 - Is Corrosion a subject of Research or Corruption? Despite 13 damaging reports from CBRI, DDA took no action on the glaring construction flaws in the Village, including lack of waterproofing that could cause flooding in the basement, that was pointed out as early as November 2009. Seepage had caused a lot of concern during the Games. CBRI says: On seeing the permeability of the concrete and the corrosion of the reinforcing steel it gives an impression that, the service life of these towers can not be more than 20 years. These towers demand lot more expendure for the repair and retrofitting beyond this period. The audit memo points out that the reinforcing steel was never covered adequately despite three reports pointing to that deficit. The reinforcing steel is more prone to corrosion when exposed to moisture, oxygen, acidic environments and chlorides, which is why it is required to be covered. In many places there was chipping of the cover concrete. About Cairn India: In India, Cairn has made 40 oil and gas discoveries. Three out of the seven landmark discoveries in India in the last decade have been made by Cairn. In January 2004, Cairn discovered the largest onshore oilfield in India since 1985 – the Mangala field in Rajasthan. To date, 25 discoveries have been made in Rajasthan.